Casa Aloha - Birder & Surfer Paradise! AC, WiFi, à quelques pas de Pavones Point! Parfait emplacement à pied à tout et chargé de goodies. L'utilisation gratuite de vélos, planches de surf, chambres à air de la rivière, tapis de yoga, chaises de plage, téléphone cellulaire et plus encore. Vivez l'expérience de vivre dans les arbres avec tout le confort que vous pourriez souhaiter - eau chaude, air conditionné, Internet haute vitesse, télévision à écran plat, matelas orthopédiques fermes, hamacs, fauteuil inclinable paresseux et chaises longues. Endroit idéal pour se détendre et profiter de la vue et de la brise ou s'étirer et pratiquer le yoga sur la terrasse spacieuse de la cabane dans les arbres et profiter du cadre tropical. Casa Aloha est à seulement 5 minutes à pied du spot de surf de Pavones Point, de la rivière, des restaurants et du centre-ville, ce qui en fait l'endroit idéal pour des vacances parfaites. Il dispose d'une cuisine entièrement équipée avec cuisinière 6 feux, four, micro-ondes, grille-pain, vaisselle et ustensiles, cafetière, mixeur, épices et huiles. Vraiment un paradis pour les ornithologues, voir régulièrement des aras écarlates, des toucans, des frégates magnifiques, des pics de bois, des perroquets, des aigrettes, des tanagers, et beaucoup d'autres espèces. Vous aurez également la chance de caresser l'un de nos chats "tabby" de la jungle rares et exotiques qui vivent sur la propriété. Clean, well equipped with lots of extras, close to everything and superb hosts. Lovely beach sunsets, surfing, warm ocean to play in waves, superb rooftop deck for morning coffee and watching birds, monkeys, etc. Wonderful stay. Hosts were excellent and provided a phone to easily contact them. Comfortable unit with big windows for bird watching. Wifi was quite reliable and fast for such a remote location. Casa Aloha was the perfect place to stay in Pavones to get some relief from the heat and enjoy some bird watching! The hosts, James and Kelley (and their adorable daughter) were so welcoming and laid back, we loved their energy and their reverence for the raw beauty, wonderful community, and special sunsets that make up Pavones. The kitchen was nice and workable, the apartment was cool and the 3 of us were very comfortable. The birdwatching from inside the apartment and on the spacious top deck was so awesome! We could put fruit out on their feeders and watch for hours. The deck on top was also great for eating dinner and breakfast, it was a nice view of the treetops with a wonderful ocean breeze and hammocks! What more could you want? They had plenty of surfboards and bikes to use and even tubes for the river (which we will have to try next time!). Their food reccomendations were sincere and awesome, we had a wonderful night out at La Pina and ate some authentic Italian pizza! The property was very nice and homey, you could tell the whole place was a labor of love. Our hosts had nice little local goodies for us throughout the trip that really showed a thoughtfulness for their guests and a pride in the community. We don't have a single negative thing to say about this place and we will not stay anywhere else in Pavones when we return (unless we're sleeping on the beach!). Pura Vida! James was a great host. We had access to surfboards and bikes. The roof top deck was great for relaxing in the hammock and playing cards at night. The house has air-conditioning in both rooms and fans. It was nice to be able to get cool in the middle of the day. We felt very secure with our rental car in private parking behind a locked gate although Pavones seems very safe anyway. 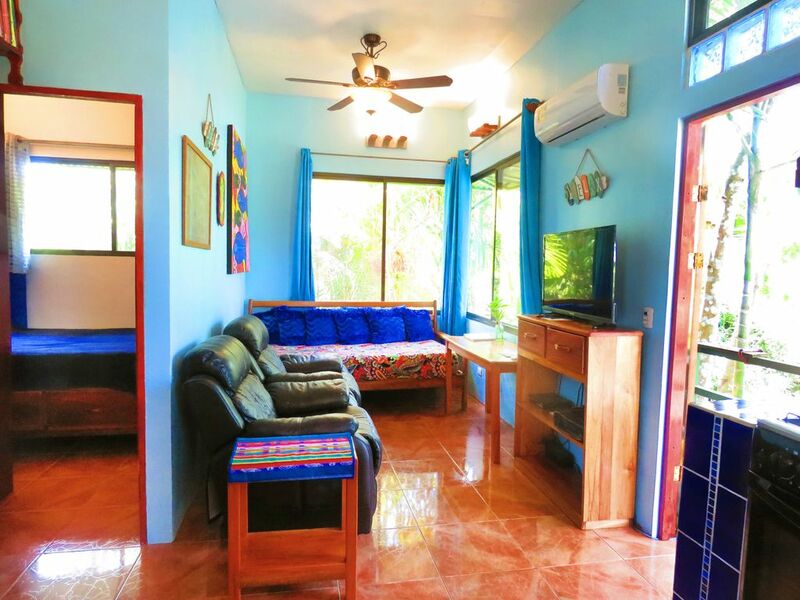 Casa Aloha is a short walk from the surf, maybe five minutes, and restaurants. It was a great location for enjoying Pavones. You can stop looking for a place to stay because this is the best and has it all. It is cute, clean, comfortable and safe for starters. The kitchen has a great gas stove, oven, microwave, large refrigerator and well stocked supplies. Owners provide purified water. Beds and bathroom are great. Upper deck is awesome for bird and animal observation. We appreciated the AC for cooling off after outdoor activities and sleeping well. The owners are so kind and are available only if they are needed. You don't need transportation once you arrive because beach, grocery stores and restaurants are easily within walking distance. You won't be disappointed, we are already planning next years return trip. Amazing home that has everything you need. You could show up with just your bathing suit and have a great vacation while staying at Casa Aloha. Bikes, boards, outdoor shower, fully stocked kitchen, towels, so many amenities to make the stay great. The surf was fun and close, Birds right off the deck that has three hammocks ! Can’t wait to come back. The owners are super nice. Friendly but provide as much privacy as you want and offer lots of great adventure ideas.